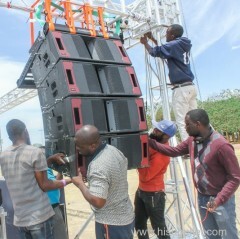 Trusses can be also setup to hang the line array speakers system in outdoor events. Aluminum trusses for sale for line array speaker support for outdoor concerts, events,shows,ect. Speakers always need to hang on the trusses rigs. Group of Speaker Trusses has been presented above, want more	Speaker Trusses and Entertainment Truss, stage lighting trusses manufacturers, Please Contact Us.